Did you know that President Trump has two portraits hanging in the Oval Office — George Washington and Andrew Jackson. Jackson is, and has always been, a controversial figure. 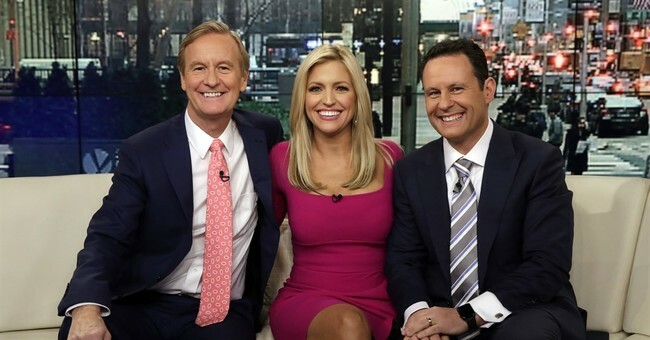 The Fox & Friends’ co-host, Brian Kilmeade — author of the new edition of Andrew Jackson and the Miracle of New Orleans: The Battle That Shaped America’s Destiny, discusses his successful history book series, how Donald Trump is a modern Jacksonian, and his success on Fox News! Learn how Andrew Jackson saved the country in the War of 1812 and became a household name who would change the course of American history. 2:40 Kilmeade talks about the admiration presidents past and present have for Andrew Jackson, whose portrait is currently in the Oval Office. 3:07 Kilmeade explains why, despite the modern approbation against Jackson, his achievements at New Orleans and elsewhere deserve America’s attention and respect. 6:27 Kilmeade breaks down the Battle of New Orleans, its significance within the wider War of 1812, and how it made Jackson one of America’s most well-known war heroes. 9:40 Kilmeade talks about Jackson’s adopted Native American son, and the way his alliances with the local Creek tribes helped win the Battle of New Orleans. 14:47 Kilmeade explains why Pres. Trump is compared to Pres. Jackson so often — and why (some of) those comparisons make sense. 16:54 Kilmeade talks about his nationwide book tour and how readers like you can attend! Brian Kilmeade is best known for being the host of Fox News’ smash Fox and Friends (a favorite of Pres. Trump.) What listeners may not know is that Kilmeade started his career at Fox in 1997 as a sports reporter. Prior to working at Fox News, Kilmeade was a TV anchor at stations in New York and Ontario, Canada! Kilmeade is the author of three bestselling “pop history” books: George Washington’s Secret Six, Thomas Jefferson and the Tripoli Pirates, and his most recent book, Andrew Jackson and the Battle of New Orleans. This is Kilmeade’s fourth interview with the Conservative Book Club — check out our Thomas Jefferson and the Tripoli Pirates interviews with Kilmeade HERE and HERE. When the British fought the United States in the War of 1812, they focused on New Orleans as a key point of riverine and maritime commerce, hoping to seize the city and cripple the young country economically. What they did not count on was Andrew Jackson. The Battle of New Orleans, fought after the signing of the Treaty of Ghent ending the war, saw Andrew Jackson make his name as a war hero and future national political figure. Marshaling the same populist instincts that won him the Presidency years later, Jackson brought together common citizens, overcame their divisions, and beat back the British invasion force. Our first interview with Brian Kilmeade about Andrew Jackson and the Battle of New Orleans. Ep. 30: What If Gen. Custer Had Survived His Last Stand? Ep. 20: Why Vicksburg Was The Turning Point of the Civil War? Make sure you never miss an episode. Subscribe to the Conservative Book Club Podcast!